Need something simple to bring a little more Valentine’s Day decor into your home? 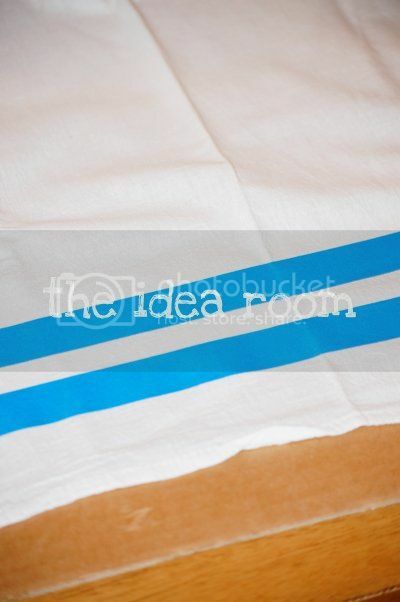 How about a practical and super simple kitchen towel? 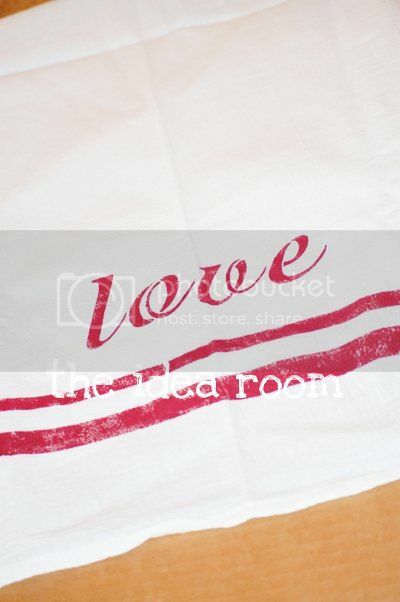 I am loving the look of the linen flour sacks that have been floating around the internet lately and this love hand towel was inspired by them. I took a boring white hand towel that I had sitting in my drawer and decided to pretty it up a bit. I think I originally found them at Kmart from Martha Stewart’s line. Then I simply took some blue painter’s tape and laid two strips down across the entire bottom length of the towel. Then taking a little stipling brush and some acrylic paint, I “stenciled” the space between the strips of tape. Then I let it dry completely…about 20 minutes. Then I removed the tape and added two more strips of new tape to make the second line. This one a made a bit thinner and placed it right above the thicker line. Let this paint dry as well. 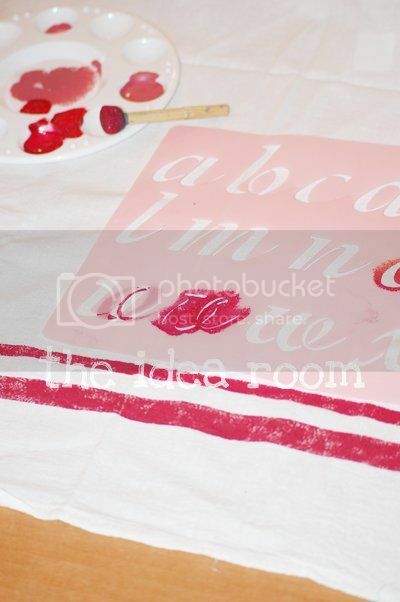 Then I took a lettered stencil that I already had on hand and stenciled the word “love” above the lines. Now, you are probably wondering if the paint can be washed. I was wondering the same thing and did not want to have to go out and buy paint specifically for fabric. 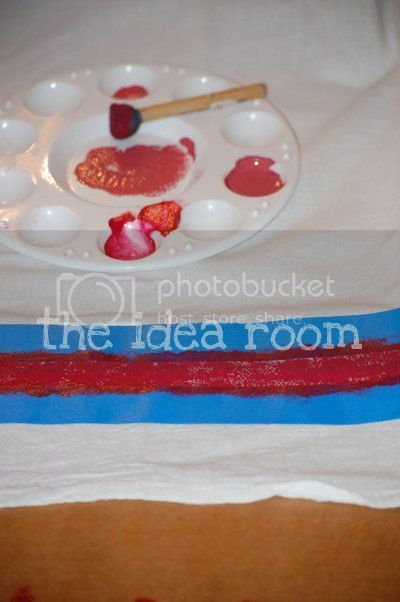 I read online that if you iron the back of the painted towel or fabric that this will heat seal the paint so that it does not bleed in the wash. So I ironed the paint on the back and then also on the front. I covered the front with a brown paper bag between the iron and the paint so that it would not accidently bleed onto my iron or the ironing board. I have washed it once by hand…so far so good. But, I am thinking that I probably won’t throw it into the wash/laundry with my white load! I am really happy with how it turned out. I want to make some more that are monogrammed for myself and for gifts. Wouldn’t monogrammed ones be so much fun? I think next time I am going to make the top line a bit thinner…but other than that…I “LOVE” how it turned out! 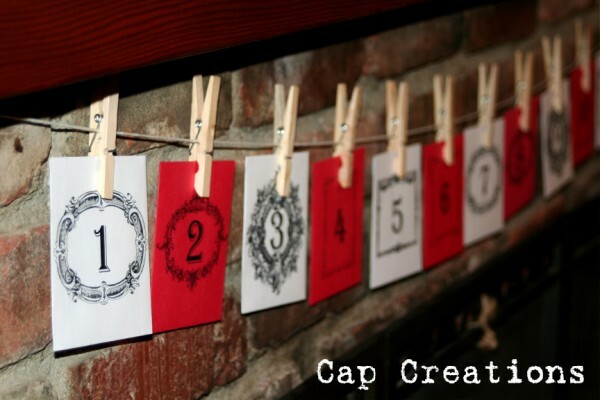 **Check out this fun Guest Post from Cap Creations over in The Idea Room Community today—Valentine Countdown Activities! **And Kristen Duke’s Say No to Auto ebook winners and the Disney on Ice winner have been posted in the community here. i LOVE this! looks great ~ can't wait to make a few for my kitchen!! Thanks for sharing such a GREAT idea!! Cute! As for washing items that you've painted: buy a bottle of fabric medium (in the acrylics paint section) and follow the instructions on the bottle to mix it with your paint. Fabric medium binds regular acrylic paint to the fabric, so the item can then be washed over and over again (with the white load!) without any problems or fading. Also, since fabric medium is translucent, it doesn't affect the paint color. I've painted several white shirts with this and it's held up for years. Amy, this turned out really great. 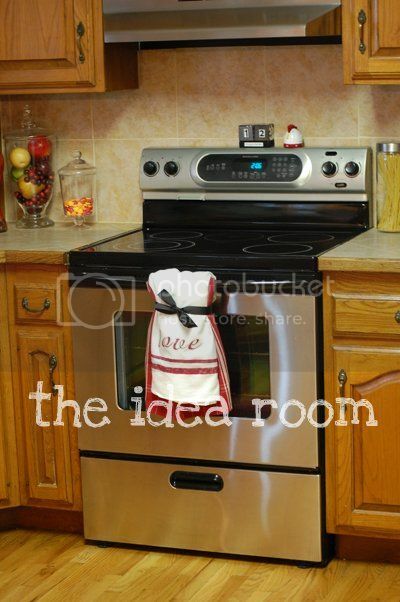 What a fun way to brighten up the kitchen for the holiday. I love these flour sacks too, but why do mine always look so wrinkled??? You would not have to worry about this bleeding at all! Acrylic paint dries to be kind of plastic-y, like those t-shirt printed with a large colorful image ~ kind of rubbery & shiny? You wouldn't worry about that shirt image bleeding, but it might crack or start peeling off the fabric after a lot of use & washing. Mixing the paint with the fabric medium mentioned above will help the flexibility of the paint (to keep from cracking) and might help it adhere a little better too, but I don't think you'll have a problem with it. With a thin layer of paint, you won't notice much of a difference. It should stay on fine! Have you ever had a clump of dried acrylic paint, like on a plate where you mixed colors? No amount of water is going to bring that back to life or cause it to start bleeding, right? cute! may have to tackle that project today. 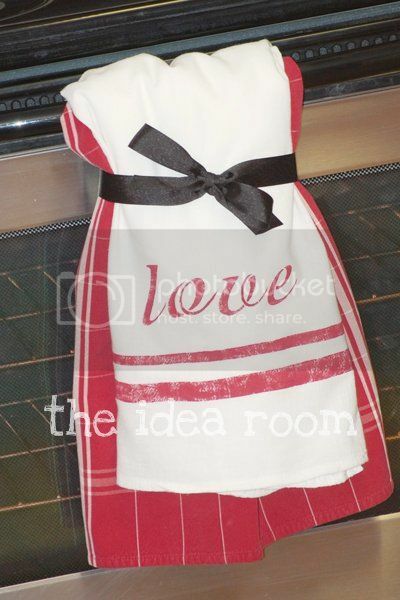 i have some towels that are white with a read stripe from ikea…so all i need to do is add the "love"! thanks for the idea! Ah, the heart of your home! That's great! I'll have to keep that in mind as a cute hostess gift. Thanks for sharing! We are celebrating Valentine's Day over at Sassy Sites with a link up PARTY! I would love to have you come by and link up this cute idea… if you haven't already! :) xoxo! So, so cute! I'm going to give this a try! Such a cute idea, and so simple! So cute!! And easy too! Gotta love that! After you iron it you can wash acrylic paint in the washer (and drier) and nothing seems to happen to it. I made place mats for my girls for Thanksgiving and Christmas by painting their hands with acrylic paint and 'stamping' them on the fabric. After multiple washes I don't think the paint even faded and never bled. I just love your ideas!! Where does your inspiration come from?? I have got to get more crafty!!!! AGH! !